Alan Hart, a member of the Wilton Fish and Game Association, demonstrates the use of a power auger for ice fishing as part of the annual Michael J. Rowe Memorial Ice Fishing Derby on Wilson Lake. This year’s derby is set for February 16. WILTON - The Wilton Fish & Game Association’s 5th Annual Michael J. Rowe Memorial Ice Fishing Derby on Wilson Lake is quickly approaching. The event will be held Saturday, February 16, from 6 a.m. to 4 p.m. at Wilson Lake. The event coincides with the Maine Department of Inland Fisheries and Wildlife’s Free Fishing Weekend. This means that any person (except those whose license has been suspended or revoked) may fish without a fishing license. Everyone can come enjoy the fun. Even people who have never gone ice fishing are encouraged to attend. 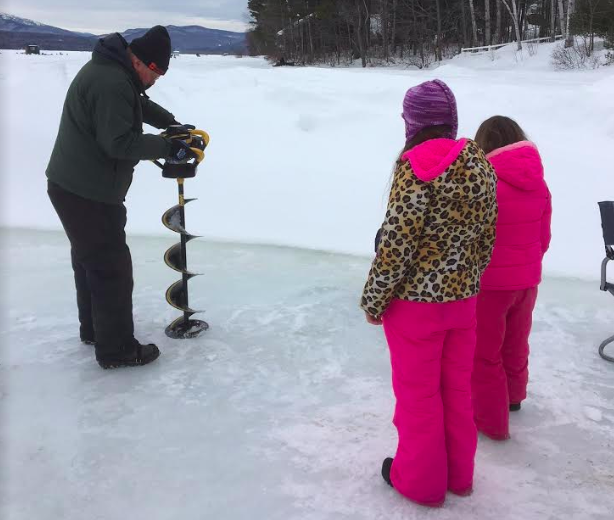 A free ice-fishing clinic for all ages will be held from 10 a.m. to 2 p.m. All bait and equipment will be provided. Registration for the event is $5. People can register from 6 a.m. to 2 p.m. the day of the event at the Wilson Lake boat launch area. Tickets are also available in advance at Shelly’s Hometown Market, Backwoods Bait and Tackle in Chesterville, Wilton Hardware in Wilton, and Robin’s Bait Shop in Jay. The first 50 youth to come to the registration shack with a ticket on the day of the event will get a free grab bag full of valuable items. Many door prizes will be given away at the event, including a 10 inch Eskimo (propane) Auger with extra blades. Other prizes include fishing and outdoor gear, and gift certificates from area businesses. All youth 15 and under participating in the event will be entered to win a lifetime fishing license donated by the Sportsmans Alliance of Maine. Youth prizes include a boxed set of Max-traps for the heaviest fish. Other categories will get a package that includes a pack basket, bait net, a Max-trap and one Narrow Gauge Cinema movie ticket. Prizes will be awarded in six youth categories: Brook Trout, Togue, Pickerel, Salmon, Bass, and White Perch. There will be a special prize for smallest fish. Food concessions will include fresh cut French fries, grilled hot dogs and bottled water. Souvenir hats and T-shirts will be available for sale. Tickets for a 50/50 drawing will also be available. Sponsors include Wood-Mizer LLC, Ross & Maureen Clair, Chesterville, and Dunkin Donuts, which provides hot coffee and cocoa for the event. The 5th Annual Michael J. Rowe Memorial Ice Fishing Derby is held in memory of Michael J. Rowe, who was killed in a tragic woods accident. For more information, phone 207-491-0780.